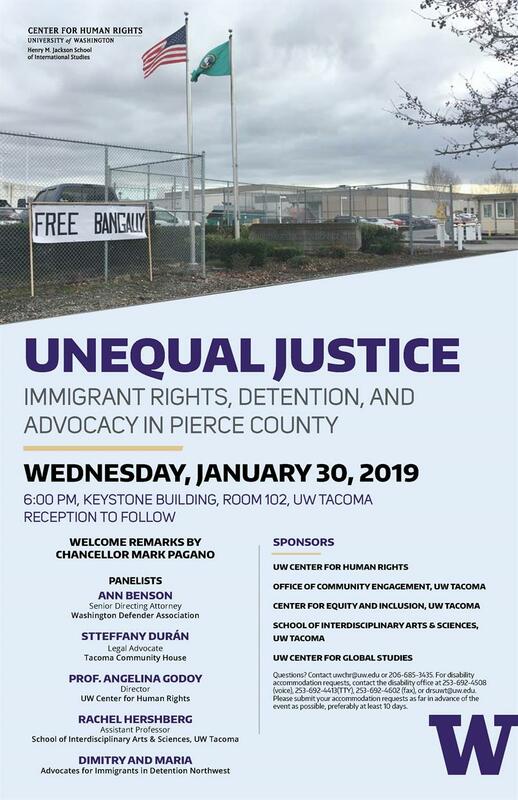 Wednesday, Jan. 30, 2019, 6 – 7 p.m.
As the site of one of the largest detention facilities on the West Coast, Pierce County and the City of Tacoma are at the center of ongoing efforts to document and challenge the systemic injustices inflicted on immigrant and undocumented communities. Panelists will present research on the impacts of federal immigration enforcement in Washington State and nationwide; and policy recommendations which cities and states can adopt to limit their involvement in immigration enforcement activities. Panelists will also discuss how detention practices are influencing clients served by their organizations and share reflections about experiences in detention.